She was an Irish immigrant cook. Between 1900 and 1907, she infected twenty-two New Yorkers with typhoid fever through her puddings and cakes; one of them died. Tracked down through epidemiological detective work, she was finally apprehended as she hid behind a barricade of trashcans. To protect the public’s health, authorities isolated her on Manhattan’s North Brother Island, where she died some thirty years later. 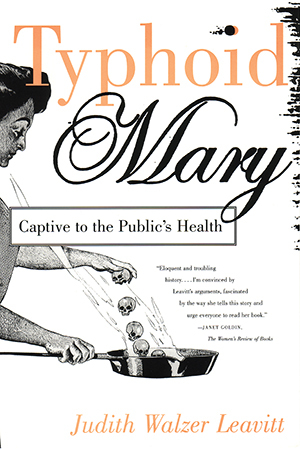 This book tells the remarkable story of Mary Mallon--the real Typhoid Mary. Combining social history with biography, historian Judith Leavitt re-creates early-twentieth-century New York City, a world of strict class divisions and prejudice against immigrants and women. Leavitt engages the reader with the excitement of the early days of microbiology and brings to life the conflicting perspectives of journalists, public health officials, the law, and Mary Mallon herself. Leavitt’s readable account illuminates dilemmas that continue to haunt us. To what degree are we willing to sacrifice individual liberty to protect the public’s health? How far should we go in the age of AIDS, drug-resistant tuberculosis, and other diseases? For anyone who is concerned about the threats and quandaries posed by new epidemics, Typhoid Mary is a vivid reminder of the human side of disease and disease control. She was an immigrant woman who made her way as a cook. Born in Ireland, she boarded a boat for America when she was a teenager. She lived with an aunt for a time, but as an adult she settled down in domestic service in New York City. She cooked in the homes of the city’s elite, in their Park Avenue brownstones and in their summer estates on Long Island or the Jersey shore. She was by repute an excellent cook and did not go unemployed for long periods. Sometimes she boarded with her employers’ sometimes she lived with friends in the city-often with one particular male friend. We do not know how happy she was in her personal life, but in her work she was said to demonstrate a certain pride and satisfaction. Some families who employed her praised her accomplishments in the kitchen and her care of the children. We do not know when she contracted typhoid fever, except that it must have been during or before 1900. She denied ever having been sick with the disease, and it is likely she never knew she had it, suffering only a mild flu-like episode. But between 1900 and 1907, she infected some twenty-two people with typhoid fever through her puddings and cakes. They suffered more serious disease symptoms; one of them died from the illness. The authorities decided she was too dangerous to be allowed to continue to earn her living by cooking. Infact, they decided she should not even be allowed to walk the streets of the city. They put her in a small bungalow on the grounds of a large isolation hospital on North Brother Island in the East River. She was thirty-seven years old. She lived alone in the cottage for more than two years and then came before a judge to plead for release from her banishment. The judge was sympathetic, but did not want to be responsible for letting the Irish woman return to New York City and continue infecting people through her cooking, so he declared her a menace to the public’s health and sent her back to the small island. Another lonely year passed. Finally a health department official decided it was not right to keep her isolated any longer, and he allowed her to go free. She worked in a laundry for a while, but she could not make a living away from her profession. Eventually, she returned to cooking. When the health authorities found her the next time, it was estimated she had spread typhoid fever through her cooking to at least twenty-five more people, another two of whom died from the exposure. This time officials isolated her back on North Brother Island for the rest of her life. She lived twenty-three more years, in the one-room cottage on the small island, alone. She worked in the island’s bacteriology laboratory for a while. She died on November 11, 1938. Mary Mallon was her name. This book tells her story—rather, her stories, for there are many, depending on the teller’s perspective and stance—to illuminate the many dimensions of sickness and sickness control that confronted Americans early in this century and continue to challenge us at the century’s end. There will be no easy answers here to our country’s present dilemmas with AIDS and tuberculosis. There will be, I hope, some insights that give meaning to our present concerns about controlling epidemics and force us to focus on the social dimensions of our efforts to combat the devastation sent our way by microbes. The many stories of Mary Mallon are the stories of the sufferers, of those who try to help the sufferers, of those who demonize the sufferers, and of those who try to prevent the suffering. They are the stories of the human side of disease and its control.